The fourth round of the ROK Cup USA Florida region is just around the corner, kicking off in exactly three weeks. With the Championship Finale event fast approaching, ROK Cup USA officials have information that all potential and confirmed entries must know. With three rounds of Florida Winter Tour now complete and the ROK Cup Champions crowned, Rokkers now move into the ROK Cup Florida, ROK Cup Midwest, ROK Cup USA Epcot Challenge, and ROK Cup USA Finale Championships to be held up and down the eastern half of the United States. 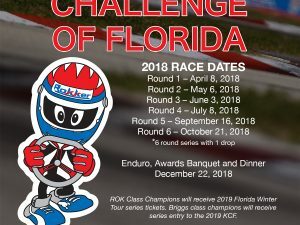 All drivers and teams who completed all three rounds of the popular Florida Winter Tour ROK Cup Championship are eligible for complimentary entry to the ROK Cup Florida Championship round at the Orlando Kart Center April 7- 9. Those who meet the requirement will receive complimentary paid registration fee, tires, transponder rental, official apparel, driver pass and mechanic pass for the ROK Cup USA Florida Championship Finale. Teams and/or drivers confirmed for the Championship Finale include but are not limited to: Ocala Gran Prix, PSL Karting, Top Kart USA, TB Kart USA, Team Koene USA, J3 Competition, Andersen Racing, NRM Motorsports, VCI powered by AM Engines, AKT Racing, Orsolon Racing, Zanella Racing, Speed Concepts Racing, Team Montoya, International Karting, NF Motorsports and Toy Vault Racing. 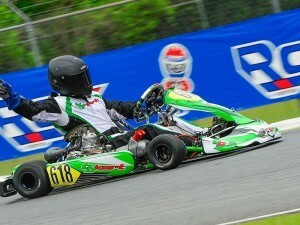 Top kart racers from across North America including race winners and champions have confirmed their entry to the event. This list is growing daily but already includes Junior ROK FWT Champion Tyler Gonzalez, Shifter Senior FWT Vice-Champion Rubens Barrichello and last year’s ROK Shifter Senior Champion Jimmy Cabrera. 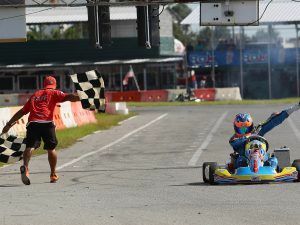 Located in the heart of Orlando, the circuit of Orlando Kart Center is the home of ROK Cup USA, providing excellent track support and paddock space. Just a short drive from the Orlando International Airport and only minutes from Walt Disney World, Orlando Kart Center is conveniently located in Central Florida. Entering the weekend, Senior Shifter is led by none other than former Formula 1 and IndyCar ace, and current Brazilian Stock Car driver Rubens Barrichello, with Formula K Kart factory driver Gary Carlton in second and AKT’s Jimmy Cabrera in third. No word has been released as to Carlton’s entry, however Barrichello and Cabrera were quite the sparring partners throughout the final event weekend of the Florida Winter Tour. Senior ROK is led by frontrunner Ryan Norberg of PSL Karting, with J3’s Austin Garrison just 30 markers in arears in second. In the Junior ROK category, Tyler Gonzalez has truly began running away with the championship, as he sits nearly 300 points ahead of Matheus Morgatto in second. Trailing the two of them is Ocala Gran Prix team driver Dylan Gennaro as he looks to make his mark evident in 2017. The Vortex Mini ROK title chase is a bit different, as first to third is separated by less than 200 points. Luca Mars, Reece Gold, and Connor Zilisch have been going head to head since Homestead earlier this year and will look to settle the score in Orlando. 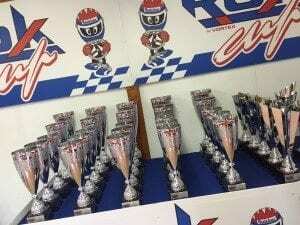 The season is just about in full speed and ROK Cup USA is ready to provide and present the karting scene with prestige racing and top-notch client service. Join the action in Orlando and “Let’s ROK” in 2017! For further information, please contact ROK CUP USA at (407) 476-5635 or email info@rokcupusa.com.